At least 42 people have died in a wildfire in Northern California that burned through the town of Paradise with shocking speed, making the Camp Fire the deadliest in state history. Fire crews are working to fight that blaze, along with another large wildfire in Southern California, where at least two deaths have been reported. “We certainly hope that the fatality count doesn’t increase, but we know there is a strong potential for that” as emergency crews sift through rubble and debris to look for potential victims, Cal Fire Chief Ken Pimlott told NPR’s All Things Considered. The Camp Fire in Butte County, about 80 miles north of Sacramento, has now burned 125,000 acres and is 30 percent contained, the California Department of Forestry and Fire Protection reported Monday night. More than 5,000 personnel are fighting the blaze, which has destroyed more than 6,500 homes and 260 commercial buildings. “Last night firefighters continued to hold established containment lines,” Cal Fire said in an update Tuesday. 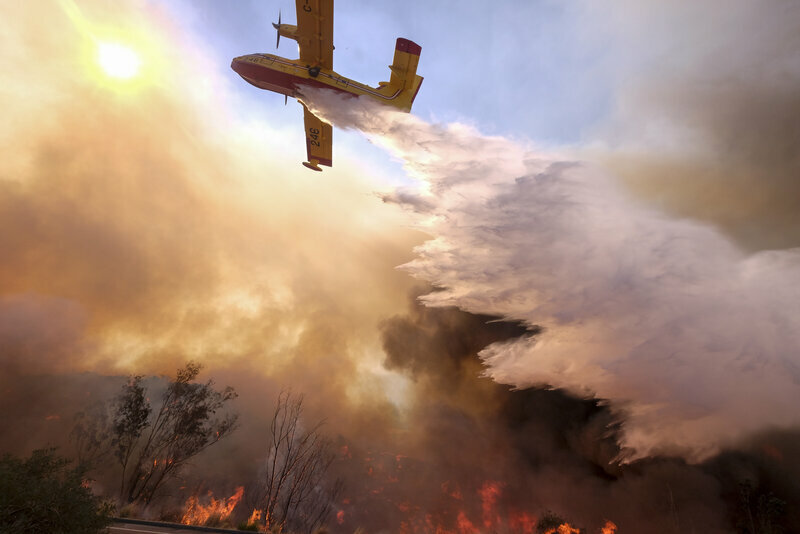 The agency said firefighters had “worked aggressively” to protect structures in the fire’s path, and that they’ve been working to build fire lines to establish control. But it added that dry conditions and steep terrain will continue to pose a challenge. 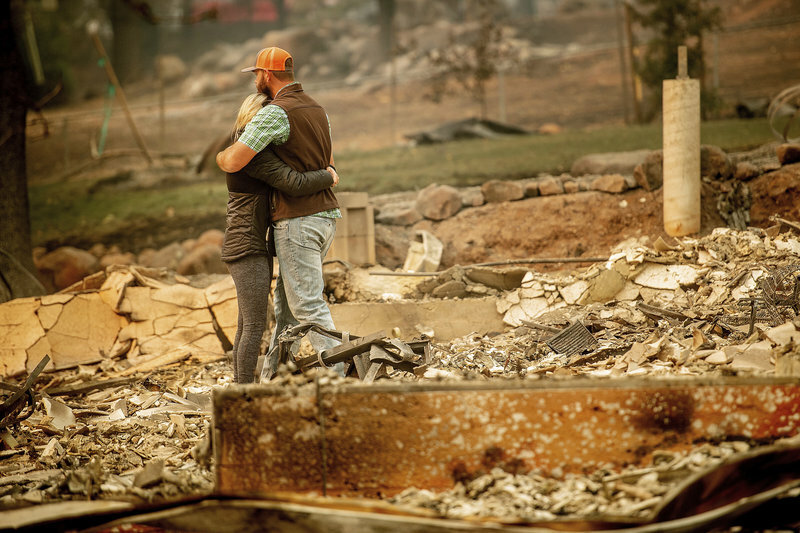 As parts of Butte County have been deemed safe, search teams and coroners have found more victims of the fire; the Butte County Sheriff’s Office reported late Monday that workers had found 13 more people who had died from the fire, adding to the 29 who had already been located. Overall, 10 sets of remains were found in Paradise and three in neighboring Concow. More human remains could be found, Honea said, adding that the county is deploying two portable morgue units and will use cadaver dogs to find others who perished. More than 50,000 people have fled the Camp blaze, according to member station KQED. And even at a distance, the fire is posing health concerns: “Air quality throughout the Bay Area remains in the ‘unhealthy’ zone, according to federal measurements,” KQED reports, adding that the conditions should persist through Friday. To the south, the Woolsey Fire has burned 96,314 acres and is 35 percent contained, Cal Fire said Tuesday morning. The fire that broke out in the Thousand Oaks area — which had already been coping with a mass shooting — is blamed for two deaths. 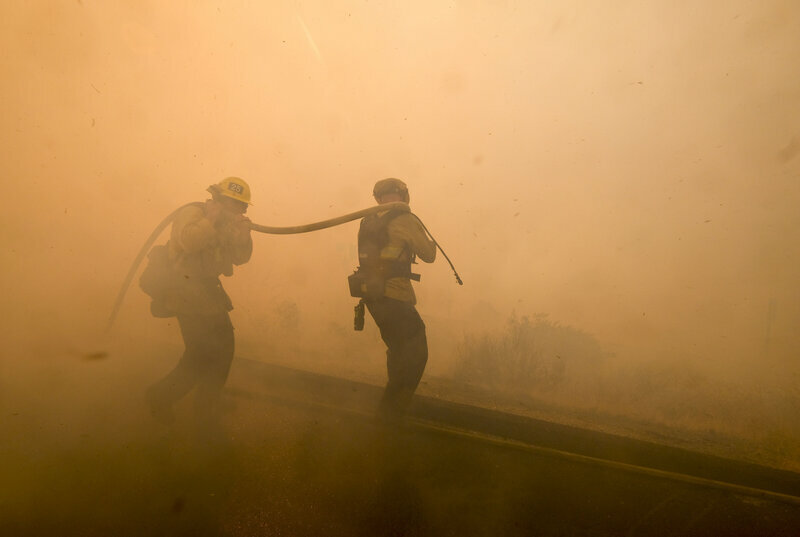 Although the fire is now 35 percent contained, firefighters are still primarily focused on protecting life and structures, citing “extreme fire behavior” from the blaze that has drawn power from Santa Ana winds. “We’ve got 60 to 70 mph offshore Santa Ana winds blowing for the next several days and those are just deadly,” Pimlott said on Monday. The Camp Fire’s death toll has grown in staggering leaps. The first notice came on Thursday, when investigators found the remains of five people in Paradise who were apparently trapped in their cars by the blaze. Four more were found on Friday, and 20 more over the weekend. Before the Camp fire struck, the most deadly wildfire in California’s history was the Griffith Park blaze, which killed 29 people in Los Angeles in 1933. Last year’s Tubbs Fire in Napa and Sonoma counties was blamed for killing 22 people.